Some flooring just needs a good thorough cleaning to make it look great again. Some might require total replacement, especially for old houses. So before moving in, it’s best to check the flooring and what must be done for it to look new again. Aside from the stubborn dirt, you should also be wary of its smell as well. It’s best to apply a fresh coat of paint on the wall while the house is empty. Aside from making the job easier and faster, homeowners can also easily spot any wall defects or damage that needs immediate repairs. Old homes usually have popcorn ceilings. These ceilings might contain asbestos and other irritants that must be taken care of first and foremost. It’s best to call a professional to the ceiling job for better results. Improving the ceiling is a messy job so it’s best to do it while the house is still empty. If the property has a big backyard and you want the pets or your kids to roam around it freely, installing a reliable fence is a must. Know your city or local laws about fencing and secure a permit for it. While this task can be done after the move, it’s best to do it before the whole family moves in. If the fence is already in place, the pets and kids can simply play in the backyard while you unpack and organize your stuff inside the house. For security reasons, all locks must be changed right after buying the property. No matter how nice and trustworthy the previous owner is, you’ll never know if a duplicate key was made and given to other people. Don’t take the risk and change the locks as soon as possible. Smoke and carbon monoxide detectors must be checked and inspected before moving in. Change the batteries to make sure it will work to its fullest capacity. Check the heating and cooling filters to see if they are still in good condition. Better yet, install a new one just to make sure that everything will work perfect and smooth. Any kind of leak must be taken care of before settling down at the new home. No matter how small it is, it must be fixed immediately before it can cause serious trouble. 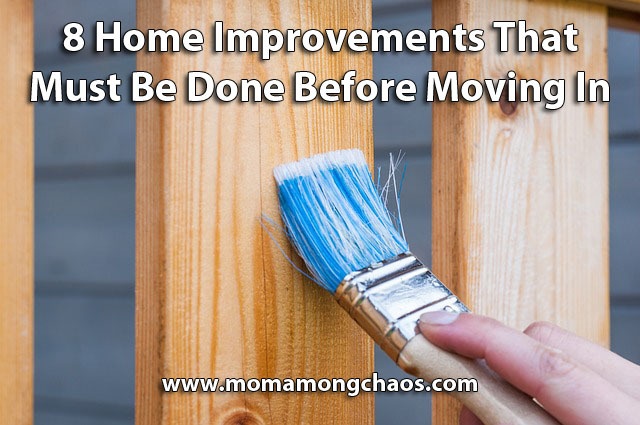 Remember, doing these home improvement projects ahead of time will save you a great amount of time and money in the long run.